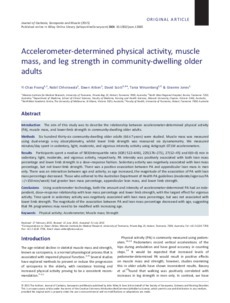 Introduction: The aim of this study was to describe the relationship between accelerometer-determined physical activity (PA), muscle mass, and lower-limb strength in community-dwelling older adults. Methods: Six hundred thirty-six community-dwelling older adults (66 ± 7 years) were studied. Muscle mass was measured using dual-energy x-ray absorptiometry, whilst lower limb strength was measured via dynamometry. We measured minutes/day spent in sedentary, light, moderate, and vigorous intensity activity using Actigraph GT1M accelerometers. Results: Participants spent a median of 583(Interquartile ratio (IQR) 522–646), 225(176–271), 27(12–45) and 0(0–0) min in sedentary, light, moderate, and vigorous activity, respectively. PA intensity was positively associated with both lean mass percentage and lower limb strength in a dose–response fashion. Sedentary activity was negatively associated with lean mass percentage, but not lower-limb strength. There was a positive association between PA and appendicular lean mass in men only. There was an interaction between age and activity; as age increased, the magnitude of the association of PA with lean mass percentage decreased. Those who adhered to the Australian Department of Health PA guidelines (moderate/vigorous PA >/=150 min/week) had greater lean mass percentage, appendicular lean mass, and lower limb strength. Conclusions: Using accelerometer technology, both the amount and intensity of accelerometer-determined PA had an independent, dose–response relationship with lean mass percentage and lower limb strength, with the largest effect for vigorous activity. Time spent in sedentary activity was negatively associated with lean mass percentage, but was not associated with lower limb strength. The magnitude of the association between PA and lean mass percentage decreased with age, suggesting that PA programmes may need to be modified with increasing age.